Benign hematologic diseases (BHD), Accessory spleen (AcS), Laparoscopic splenectomy, Transumblical multiport splenectomy (TUMPS). A missed Accessory Spleen (AcS) in hematologic operations can cause recurrence of Benign Hematologic Disease (BHD) after splenectomy . In the normal population, the incidence of AcS is 10%, but in patients with BHD, it may be as high as 30% [2-4]. Based on the literature, a consensus has not been reached regarding the best method for the detection of AcS . Preoperative diagnostic methods such as Computed Tomography (CT), Magnetic Resonance Imaging (MRI), Nuclear Scintigraphy (SC) and Ultrasonography (USG) may be beneficial for detecting accessory spleens . CT of the abdomen and pelvis has been argued to be an accurate method for detecting AcS preoperatively [5,6]. Some authors reported that exploratory laparoscopy was superior to preoperative CT scanning [7,8]. It was also found that there was no difference between Laparoscopic Splenectomy (LS) and Open Splenectomy (OS) with respect to identification rates of AcS [9,10]. Nowadays, LS has become the standard operative technique for managing various BHDs of the spleen [11,12]. Transumbilical Multiport single-site Laparoscopic Splenectomy (TUMPS), as a minimally invasive technique was introduced and has been widely accepted by surgeons in the last decade. No studies have evaluated the efficacy of TUMPS in detecting AcS. The aim of this study was to compare the capability of both laparoscopic techniques for AcS detection. In this retrospective study, 46 patients underwent either LS or TUMPS because of BHD between Jul 2009 and Jan 2015. Patients who underwent laparoscopic surgery for traumatic splenic injury and splenic malignancy and those with a Body Mass Index (BMI) higher than 40 kg/m2 were excluded from the study. The BHD group consisted of patients with medically refractory chronic Immune Thrombocytopenic Purpura (ITP), Hereditary Spherocytosis (HS) and Autoimmune Haemolytic Anaemia (AHA). The study was approved by the ethics committee of Goztepe Education and Research Hospital. Written informed consent was obtained from each patient prior to surgery. The study met the requirements of the Declaration of Helsinki. Pneumococcus (Pneumovax 23, Merck and Co., Inc. White house Station, NJ, USA) and Haemophilus influenza type B (Hiberix, GlaxoSmithKline) vaccines were administered to all patients at least two weeks before surgery. Platelet counts were under the 50,000 /mm3 in all patients. The risk of operative bleeding was reduced with intravenous (IV) prednisolone (1 mg/kg) and IV immunoglobulin (Ig) G (1 g/ kg). Preoperatively, contrast-enhanced CT of the abdomen and pelvis, SC of the spleen, and abdominal USG evaluations were performed on all patients to evaluate for concomitant AcS. First-generation cephalosporin was administered IV within 1 h of beginning surgery. Two laparoscopic groups were compared in terms of operation time, length of hospitalization, operative blood loss, and visual analog scale (VAS) pain scores. The patients were followed up together in the haematology clinic 1, 6, and 12 months postoperatively. Patients were placed in the right lateral decubitus position with the left flank elevated 45 degrees on a gel cushion. The operation table was tilted to the right side completely to obtain an 80-90 degrees right lateral decubitus position. In the TUMPS group, a 25 mm vertical skin incision was made within the umbilical pit (Figures 1A and 2), and a skin flap was created by detaching the subcutaneous fat towards the left superolateral direction about 3 cm from the umbilicus (Figure 1B). Pneumoperitoneum was established to 12 mm Hg through a veress needle. Subsequently, a 10 mm trocar was introduced in the middle of the incision. After exploration of the abdominal cavity, additional 10 mm and 5 mm trocars were introduced from the left lateral and superior sides, respectively; each was 3 cm distant from the first trocar, thus constituting the working triangle (Figure 1C). Placing these trocars apart in this way reduces contact between instruments. A complete exploration for accessory splenic tissue was performed, followed by standard dissection techniques for laparoscopic splenectomy. The spleen was retracted medially and diaphragmatic attachments were freed from the lower pole to the upper using a LigaSureTM Vessel Sealing System (Valleylab, Boulder, Co, USA), harmonic scalpel (Harmonic Ace, Ethicon Endo Surgery) and hook dissector. Figure 1. (A) Vertical skin incision within umbilical pit; (B) Skin flap for trocars; (C) Trocar positions and working triangle; (D) Endobag replacement to extract the morcallated spleen. Figure 2. 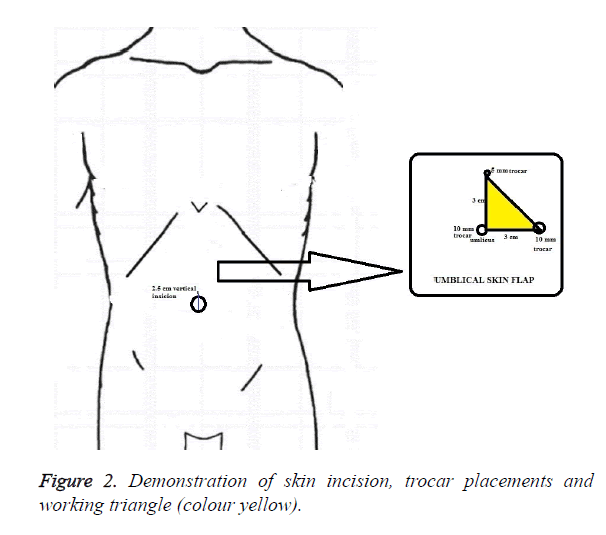 Demonstration of skin incision, trocar placements and working triangle (colour yellow). The superior attachments were left uncut to keep the spleen suspended. The splenocolic ligament was then dissected to liberate the lower pole. The spleen was retracted superolaterally by keeping the residual part of the splenocolic ligament. This maneuver facilitates the exposition of the hilum. The dissection proceeded by using LigaSureTM from the hilus to the upper pole. The splenic artery and vein were ligated twice and transected. The next step was the ligation of the short vessels of the stomach and mobilization of the gastrosplenic ligament through the splenic hilum. The division of short gastric vessels was performed using a LigaSureTM and Harmonic AceTM, especially in the narrow plane between the stomach and upper splenic pole. After complete splenic mobilization and haemostasis, the scope was moved into the left lateral trocar, and the midline trocar was removed and substituted by a 15 mm endobag (Endocatch II, Covidien, Mansfield, MA) (Figure 1D). The spleen was placed into the endobag, morcellated carefully through the umbilical incision, and extracted. The AcS was extracted with another endobag. The trocars were removed, the abdomen was desufflated, and all facial openings were re-approximated and the skin was closed. In all cases, only conventional laparoscopic instruments were used. In the standard LS group, splenectomies were performed using the classic technique with four trocars. The same dissection techniques were used in this group. Statistical analyses were performed using the statistical package SPSS 17 (SPSS, Chicago, IL, USA). Differences between variables were compared using the non-parametric Mann-Whitney U-test and the Chi-square test. Results were considered statistically significant when the two-tailed P value was less than 0.05. The patients consisted of 28 women and 18 men with a mean age of 56 y (range, 21-69 y). The mean follow-up time was 42 months (range, 21-57 months). The diagnoses were ITP in 43 (93%) patients, HS in two (4%) patients and AHA in one (2%) patient, respectively. The mean splenic weight was 426 g (range, 330-660 g) in the TUMPS group and 440 g (range, 300-590 g) in the LS group. Extra trocars were used for three patients in the TUMPS group (Table 1). There was no need for conversion to OS. There were no statistically significant differences between the two groups regarding hospitalization (p=0.178), operation time (p=0.342), intraoperative bleeding (p=0.076) and VAS pain score (p=0.718) (Table 2). Table 1. Demographic information’s of patients (ITP: Immune thrombocytopenic purpura, HS: Hereditary spherocytosis, AHA: Autoimmune haemolytic anaemia). Table 2. Comparison of two groups for hospitalisation, operation time, blood loss and VAS pain score. 27 (59%) patients underwent TUMPS and 19 (41%) underwent LS. In total, 13 cases of AcS were detected intra-operatively in 11 of the 46 patients (23.9%); six AcS in the LS group and seven in the TUMPS group. AcS was found twice in two different patients (patient 4 and 6) (p>0.05). AcS was detected in five (10.7%) patients preoperatively, all of which were detected using CT. AcS was observed in three patients using SC, and in only one patient with USG. The sensitivity of CT, SC, and USG in the evaluation of AcS was 45.4%, 27.2% and 9%, respectively (Table 3). Table 3. Preoperative and intraoperative detection rates of AcS in groups (CT: Computed tomography, USG: Ultrasonography, SC: Nuclear scintigraphy). The locations of AcS were the splenic hilum (n=5, 38.4%), the lower pole of the spleen (n=3, 23%), the gastrosplenic ligament (n=2, 15.3%), the omentum majus (n=1, 7.6%), the gastrocolic ligament (n=1, 7.6%), and the tail of the pancreas (n=1, 7.6%). The mean size of AcS was 9 mm (range, 5-20 mm). Relapse of underlying BHD developed in three of these eleven patients (patient 5, 8, and 11), one in the LS group and two in the TUMPS group, which was not statistically significant. No AcS was detected postoperatively using USG, SC or CT evaluations in these patients with relapse (Table 4). Table 4. The underlying disease; localization sites, sizes and numbers of AcS; preoperative diagnostic tools; extra trocar need and relapse of the underlying disease. The platelet counts increased to >100,000/mm3 in all patients immediately after surgery. Despite the disappearance of steroid requirements, two patients had severe thrombocytopenia secondary to viral infections at 6 and 9 months postoperatively, which resolved with medical treatment. The laparoscopic approach for splenectomy has been proven as superior to OS with less blood loss and shorter hospitalization. Bowel function returns faster and there is also decreased narcotic drug requirement for postoperative pain . Recent studies have shown that the Single Incision (SI) technique has less scar formation, less postoperative pain and more patient satisfaction compared with LS, which is why surgeons are trying to move on to minimally invasive modalities [13,14]. With TUMPS, we reduce the cost of surgery by using conventional laparoscopic instruments. This approach eliminates the training curve for novel specific articulating instruments. The surgeon also gains an adequate working triangle, which is not possible in the classic SI technique. Operative procedures, operative difficulties, operating time, blood loss, and other parameters have been compared between standard LS and SI techniques. Fan Ying et al. reported that the operation time and duration of hospitalization were equal in both groups. Mortality, morbidity and operating costs were also found as similar. Less postoperative pain was determined in SI group but this was not statistically significant . Bayraktar et al. compared operation time, total blood loss, hospital stay, postoperative pain, and patient satisfaction between the two groups and found no statistically significant differences . Gkegkes et al. performed a systematic search on PubMed and Scopus databases to investigate the existence of clinical evidence of the SI technique used in splenectomy. Less morbidity, shorter hospitalization, and good cosmetic outcomes were found as benefits of this technique . Our study is the first in the literature to compare standard LS with TUMPS for the detection of AcS and we found that the results regarding hospitalization time, operation time, total blood loss, and VAS pain scores were similar. The most common indication for elective splenectomy in medically refractory cases is ITP. In our study, 43 (93%) patients underwent surgery because of ITP. The presence of missed AcS in previous splenectomy is the major cause of BHD relapse. The incidence of AcS detected in splenectomy was reported as 5%-44% in different studies . In a multicentre study, 309 patients underwent LS for hematologic diseases and AcS were found in 25 (8%) patients . Habermalz et al. detected similar rates of AcS in both LS and OS . On the other hand, in an autopsy series of 720 patients with no history of hematologic diseases, 54 cases AcS were found incidentally in 48 (6.7%) cadavers . In our study, six AcS were detected in the LS group and seven in the TUMPS group (p>0.05). The incidence of AcS was found as 23.9%, which is in line with the literature. Splenectomy mostly treats the underlying BHD. However, the presence of missed AcS is very important and reported as a cause of recurrent or unresolved disease [6,22]. Remission rates reach up to 84% in long-term follow-up and relapse may be seen in nearly 20% of patients after splenectomy [23,24]. This emphasizes the importance of missed AcS in treatment failure. Authors have recently focused on the detection of AcS and studies with larger numbers of patients are required. Intraoperative failure to identify AcS and spilling and subsequent hypertrophy of splenic tissue after the prior operation are the reasons for relapse [16,25,26]. Thrombocytopenia reveals recurrence in this case, which indicates scintigraphic evaluation [6,16]. In a study by Gigot et al. the presence of remaining splenic tissue was proved scintigraphically in 9 (50%) patients. Interestingly, CT scans revealed the presence of the splenic tissue in only 5% of cases. Despite this, only 3 (16%) patients from this group manifested clinical thrombocytopenia. Stanek et al. reported the recurrence of ITP in 3 (9%) patients. In those cases, the presence of splenic tissue was proved scintigraphically . In our study, relapse was observed in three (6.5%) patients; AcS in the prior operation was isolated in each but relapse could not be prevented. No residual splenic tissue or AcS was detected on USG, SC, or CT postoperatively. The rates of relapse could not be compared between the groups due to the scarcity of cases. The usual locations of AcS are the hilum of the spleen, the vascular pedicle of the spleen, retroperitoneally around the tail of the pancreas, the greater omentum along with the greater curvature of the stomach, the mesentery of the intestine, the left broad ligament in women, the pouch of Douglas, and the left testis . Recent reports described that the majority of AcS detected during surgery was located in the left upper quadrant and therefore laid within the operating field [3,16,22]. Consequently, this area should be investigated thoroughly during surgery. A specific search for AcS was recommended because it was reported that at least 15% of all AcS were found outside the splenic area . In our study, 5 (39%) of the 13 AcS were found in the splenic hilum and 3 (23%) were in the lower pole of the spleen. The detection rate in the left upper quadrant was 92%. As the experience of surgeons with laparoscopic instruments increases, AcS can be easily detected with a meticulous approach. AcS detection rates with TUMPS have not been reported previously in the literature. In our study, the rate of detected AcS in the TUMPS group was 25.9% (7 in 27 patients) and 31.6% (6 in 19 patients) in the LS group. The rate of AcS in the LS group is similar to the literature. It should also be noted that performing a more careful exploration has an important role in determining AcS. The laparoscopic approach has the advantage of magnified access to the perisplenic regions, lesser sac, and tail of the pancreas . In our study, all AcS that were reported in preoperative investigations could be detected intraoperatively. LS and TUMPS were both found to detect or accurately exclude the presence of AcS. There was no statistically significant difference between the two groups in evaluating AcS. LS have become the gold standard in medically refractory BHD and TUMPS is a good alternative. TUMPS can be used with cheaper classic instruments because current single-site laparoscopic tools are more expensive and may not be available in each operating room. Performing a more careful exploration has an important role in determining missed AcS and it can be achieved using either laparoscopic method in experienced hands. We suggest that LS and TUMPS are similarly effective in the detection of AcS. This study was approved by the Ethics Committee of the hospital. This study was not funded by any foundation or institute. Koshenkov VP, Pahuja AK, Nemeth ZH. Identification of accessory spleens during laparoscopic splenectomy is superior to preoperative computed tomography for detection of accessory spleens. JSLS 2012; 16: 387-391. Halpert B, Gyorkey F. Lesions observed in accessory spleens of 311 patients. Am J Clin Pathol 1959; 32: 165-168. Rudowski WJ. Accessory spleens: clinical significance with particular reference to the recurrence of idiopathic thrombocytopenic purpura. World J Surg 1985; 9: 422-430. Carroll BJ, Phillips EH, Semel CJ. Laparoscopic splenectomy. Surg Endosc 1992; 6: 183-185. Napoli A, Catalano C, Silecchia G. Laparoscopic splenectomy: multi-detector row CT for preoperative evaluation. Radiol 2004; 232: 361-367. Gigot JF, Mabrut JY, Matairie S. Failures following laparoscopic splenectomy and their management with special reference to accessory spleens and splenosis. Prob Gen Surg 2002; 19: 80-94. Stanek A, Stefaniak T, Makarewicz W. Accessory spleens: preoperative diagnostics limitations and operational strategy in laparoscopic approach to splenectomy in idiopathic thrombocytopenic purpura patients. Langenbecks Arch Surg 2005; 390: 47-51. Quah C, Ayiomamitis GD, Shah A. Computed tomography to detect accessory spleens before laparoscopic splenectomy: is it necessary? Surg Endosc 2011; 25: 261-265. Sampath S, Meneghetti AT, MacFarlane JK. An 18-year review of open and laparoscopic splenectomy for idiopathic thrombocytopenic purpura. Am J Surg 2007; 193: 580-583. Winslow ER, Brunt LM. Perioperative outcomes of laparoscopic versus open splenectomy: A meta-analysis with an emphasis on complications. Surg 2003; 134: 647-653. Wu JM, Lai IR, Yuan RH. Laparoscopic splenectomy for idiopathic thrombocytopenic purpua. Am J Surg 2004; 187: 720-723. Akwari OE, Itani KM, Coleman RE. Splenectomy for primary and recurrent immune thrombocytopenic purpura (ITP): current criteria for patient selection and results. Ann Surg 1987; 206: 529-541. Casaccia M, Torelli P, Squarcia S. Laparoscopic splenectomy for hematologic diseases: a preliminary analysis performed on the Italian Registry of Laparoscopic Surgery of the Spleen (IRLSS). Surg Endosc 2006; 20: 1214-1220. Mortele KJ, Mortele B, Silverman SG. CT features of the accessory spleen. Am J Roentgenol 2004; 183: 1653-1657. Fan Y, Wu SD, Kong J. Single-incision laparoscopic splenectomy with conventional instruments: preliminary experience in consecutive patients and comparison to standard multiple-incision laparoscopic splenectomy. J Laparoendosc Adv Surg Tech 2014; 24: 799-803. Bayraktar B, Bayraktar O, Ozemir IA. Comparison of two minimal invasive techniques of splenectomy: Standard laparoscopy versus transumbilical multiport single-site laparoscopy with conventional instruments. J Minim Acc 2015; 11: 143-148. Gkegkes ID, Mourtarakos S, Iavazzo C. Single-incision laparoscopic splenectomy. JSLS 2014; 18. Park AE, Birgisson G, Mastrangelo MJ. Laparoscopic splenectomy: outcomes and lessons learned from over 200 cases. Surg 2000; 128: 660-666. Targarona EM, Espert JJ, Balague C. Residual splenic function after laparoscopic splenectomy: a clinical concern. Arch Surg 1998; 133: 56-60. Habermalz B, Sauerland S, Decker G. Laparoscopic splenectomy: the clinical practice guidelines of the European Association for Endoscopic Surgery (EAES). Surg Endosc 2008; 22: 821-848. Unver DN, Uysal II, Demirci S. Accessory spleens at autopsy. Clin Anat 2011; 24: 757-762. Gigot JF, Healy ML, Ferrant A. Laparoscopic splenectomy for idiopathic thrombocytopenic purpura. Br J Surg 1994; 81: 1171-1172. Morris KT, Horvath KD, Jobe BA. Laparoscopic management of accessory spleens in immune thrombocytopenic purpura. Surg Endosc 1999; 13: 520-522. Altaf AM, Sawatzky M, Ellsmere J. Laparoscopic accessory splenectomy: the value of perioperative localization studies. Surg Endosc 2009; 23: 2675-2679. Vianelli N, Galli M, de Vivo A. Efficacy and safety of splenectomy in immune thrombocytopenic purpura: long-term results of 402 cases. Haematologica 2005; 90: 72-77. Rottman SJ, Podolsky ER, Kim E. Single port access (SPA) splenectomy. JSLS 2010; 14: 48-52.